A multi-level cascade drops over a series of ledges, with some free-falling sections, into a deep, clear, blue-green pool at the base. The smooth rock is layered with colorful bands, and the slopes around the falls are covered with plants that come alive with color in spring and fall, such as rhododendron, mountain laurel, and maple. From Asheville, take the Blue Ridge Parkway south past Mount Pisgah and the junction with US Hwy. 276 (27.7 miles from NC 191). Or head up to the parkway on US 276 from Brevard, NC for 15.1 miles, and go south. The Graveyard Fields overlook is 7 miles south of US 276 on the Parkway at milepost 418; park there. The trail down to the falls starts at the right side of the large map. Go down the stairs; the first part of the trail is paved and winds downhill through thickets of rhododendron. It then descends another set of steps to reach a wooden bridge over a neat section of the Yellowstone Prong above the falls. Turn right past the bridge, and bear right at the next intersection, following the signs to Second Falls. Bear right yet again at the next intersection, and go down the very long set of steps to the viewing area at the base of the falls. This is one of the most popular waterfalls in the state. 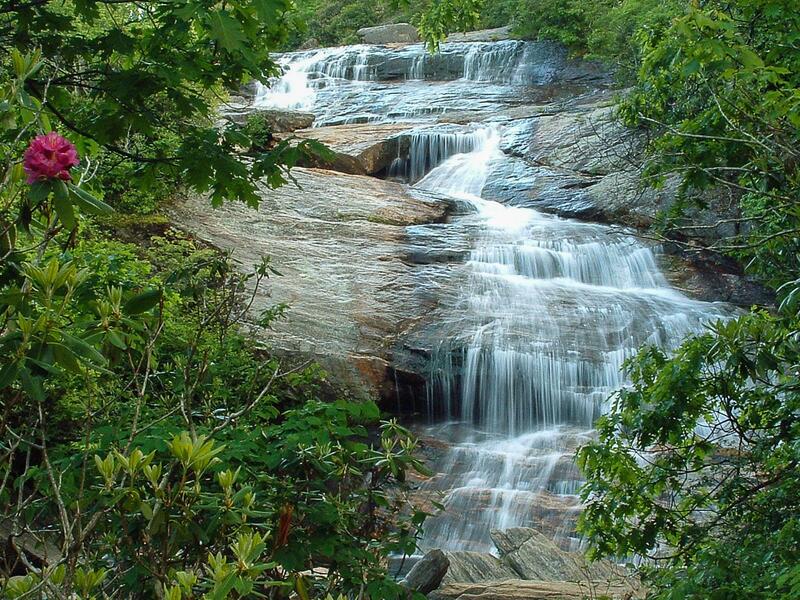 From its easy view along the Parkway, to the easy trail to the top (and steps to the base), and the beautiful scenery in the surrounding Graveyard Fields area, be prepared to share this falls with others! The viewing area at the base is nice for hanging out and you will find sunbathers here most of the summer. The pool at the bottom is great for swimming.